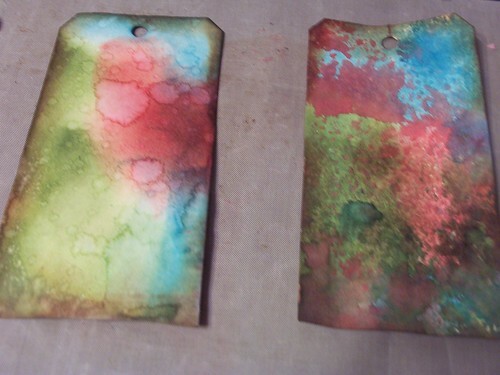 I have been toying with trying out the Creative Chemistry class with Tim Holtz. I hesitated mostly because I teach both professionally and for fun. I tend to be rather critical of classes and in case you didn't know this, teachers are like the worst students ever. I never want to do the project as the teacher set it up. 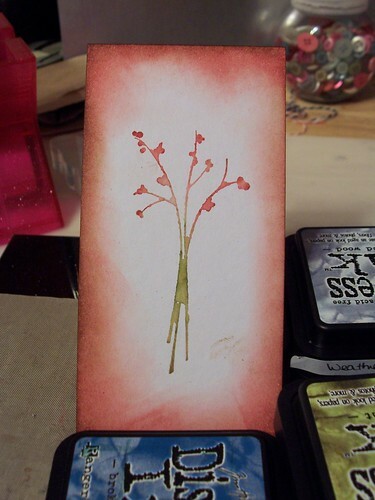 I was drawn to this class because it is self-paced, it's Tim Holtz, the projects are totally technique oriented, it's Tim Holtz, it used a wide variety of products, it's Tim Holtz, and I could use what I have at home to make something I like not what the teacher likes (did I mention Tim Holtz is teaching it?). Anyway I had my first opportunity to try a couple techniques out. These are all distress ink + water techniques. The brush-less watercolor is my favorite but the two backgrounds have potential with some more practice. 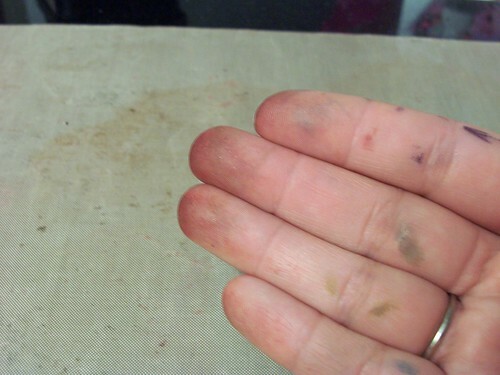 Of course how do you know you just took a tip or two from Tim Holtz? 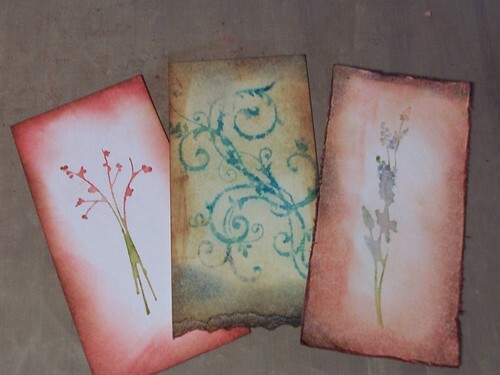 Today is the Papertrey Ink March Blog Hop. This is the first time I've gotten my act together in enough time to actually post for the blog hop. The inspiration picture they chose is full of yellows and and blues. I have been planning to send my dad a thank you note for the great bicycle he got me while he was visiting for Spring Break. The bike is a light aqua blue and I have had a blast riding with Lizzy around the neighborhood. When I saw the inspiration photo I knew the card I had in mind for him would be a perfect match to the blog hop. I started with the Everyday Button Bits stamp set. 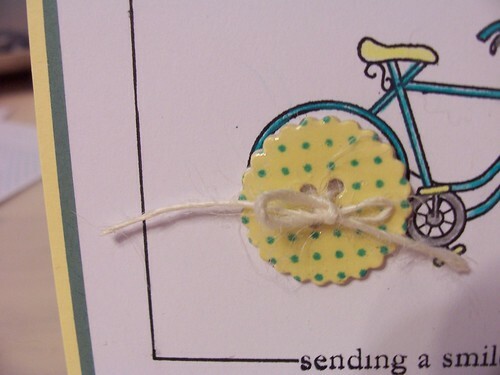 I love all the stamps in this set but the bicycle is my favorite (and is similar to my cruiser!). 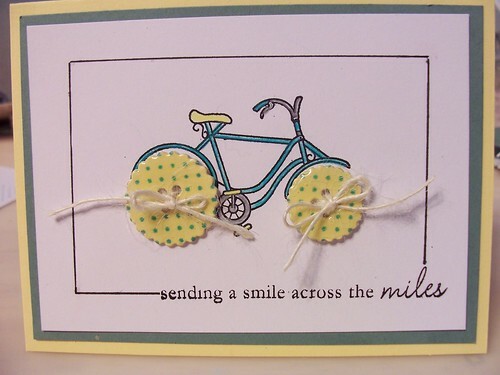 I also pulled the "smiles across the miles" sentiment from the stamp set. After searching through my 1,000+ button stash looking for the perfect buttons it dawned on me that I own the buttoned up dies. I pulled them out and cut from a coaster and a piece of matching yellow paper. 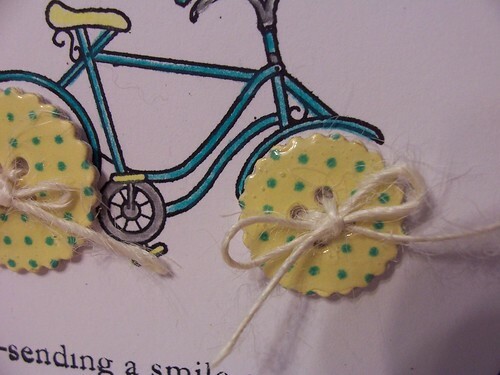 I stamped with a polka-dot stamp in blue. To finish it off I covered the buttons with glossy accents. A little button twine and a box to frame it in finished the card off nicely. I think before I send it to Dad I'll add a picture of Lizzy (and perhaps me) riding down the street. I have a little more Deadbeat Designs love to share with you today. 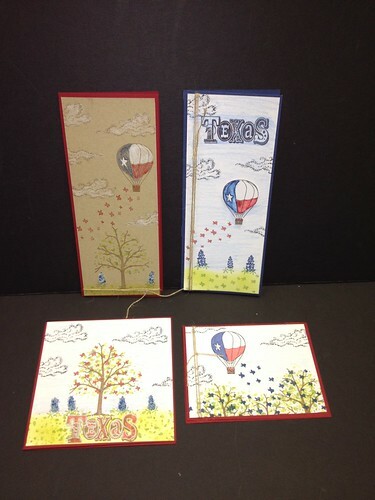 These cards feature Texas balloon, cloud, small bluebonnets, leaves etc, multiple Texas, Ornate Texas and tree for all reasons. I layered shades of green ink (pear tart and bamboo leaves) to make the grass and leaves. Some of the bluebonnets are topped with flower soft. I finished coloring with colored pencils and glitter pens.